I wanted to make this for my cousin who’s house I was staying at. A long while ago, my cheeky cousin as my sister in law would describe him, asked me one day to make a salted caramel cheesecake and he did get a telling off!!! What she didn’t realise was that it’s so much easier for me to bake something that someone wants to eat rather then thinking what shall I make? Anyway remembering that day I just knew what I wanted to bake which was great, I thought. When I envisioned this salted caramel cheesecake, I wanted it to include a caramel sauce within the cheesecake as well as being on top. So, was this recipe easy to find, NO not particularly. 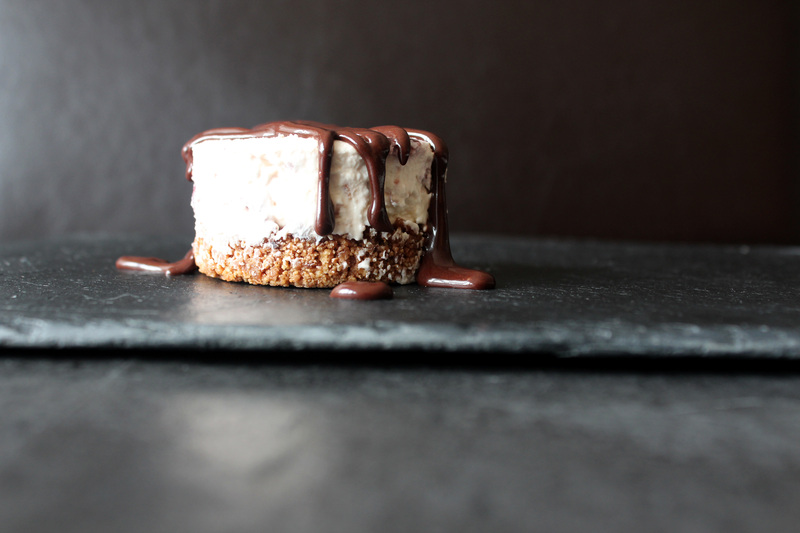 Most of the salted caramel cheesecakes are based around a vanilla based cheesecake with salted caramel sauce on top. Butttt……..luckily I found one, and even better it was very simple to make! wohooo result. I was however very heartbroken with this cheesecake, as I had issues, very big issues I might add. The issue was in taking the cheesecake out from the tin. The base came apart and broke! I was so disheartened and it really looked like a patch job. Luckily my cousin was fine with it but I wasn’t. I usually don’t use these huge tins as I prefer small individual tins, so this has put me off from making cheesecakes in these huge springform tin now! I do think there are slight adjustments I need to make to make this exceptional and it was just lacking that oomph! Next time I would add a lot more caramel sauce on the top and a bit more salt as that didn’t come through. Also I would add some caramel sauc on the base of the cheesecake too. Apart from that the cheesecake was super simple to make. 1. Start by lining and greasing a 10" spring form pan or mini spring form tin. 2. In a food processor or zip lock bag grind/bash the biscuits until they form crumbs. Place in the fridge to set. 3. Preheat oven to 160°C. Wrap foil tightly around pan to form a barrier against water. Foil should come as high up pan as possible all the way around. 1. In a stand mixer add the brown sugar and blend until clumps are removed, add the caramel and mix again until smooth. Add the cream cheese and sour cream until combine then mix in vanilla. Add eggs, one at a time – on low – blending gently after each addition, don’t over mix. 2. Pour into prepared crust and place into a large roasting pan. 3. Pour boiling water carefully outside pan, creating a hot water bath. Make sure the water level is below the top of the foil. 5. Leave to cool in the fridge preferably overnight. 6. Top with additional salted caramel sauce. *For best results leave the cheesecake to cool in the oven. Autumn is fully upon us. When I think of Autumn I think of colours, warmth and spice. I love walking through crunchy leaves that have fallen from trees with their vast array of orange, red and yellow colours. Autumn also makes me think of spice and warmth as the nights starts to get chilly all I can think of having is some hot comforting soup. Pumpkin is a very autumnal vegetable and when autumn arrives I always attempt to make something sweet with pumpkin. I have previously made pumpkin scones and pumpkin strudel with molten chocolate, both were so delicious. I always have been interested in pumpkin pie, I did make one when I was younger but it didn’t turn out well :s. maybe one day I will aim to make another. When I make pumpkin recipes I do prefer that the pumpkin doesn’t taste so raw, I like the pumpkin to be sweet but not too sweet just sweet enough to take the taste of pumpkin away. I also like there to be enough spice. I really enjoyed these cheesecakes they were full of spice (I added a lot more), the texture was soft and moist and were generally yummy! The only downside I would say was I just had enough mixture to make 12 mini cheesecakes, I prefer there to be a bit more mixture so they are taller. When I make these again I will have to adjust the cheesecake mixture so I can get a lot more mixture from it. 1. Preheat the oven to 175°C and tin and grease a mini tin. 1. Process the cookies and sugar in a food processor until ground into fine crumbs or bash in a bag. Then add the melted butter. Press the crumb mixture evenly into the bottom of the prepared pan. Bake until the crust is set, about 5 minutes. Set on a cooling rack while the filling is prepared. 1. Beat the cream cheese in a medium bowl until smooth, about 1 minute. Add the brown sugar, pumpkin, Greek yogurt or sour cream, egg, vanilla, pumpkin spice, and beat until smooth and well combined, don't over mix. 2. Divide the filling evenly between the 12 cavities. Bake on the middle rack of the oven for about 12-15 minutes or until set but just a bit wobbly in the center. Begin checking for doneness after 10 minutes, as oven temperatures vary considerably. Cool completely in the refrigerator for a minimum of 2 hours or overnight. 1. In the stand mixer whip the cream, sugar and spice until it forms stiff peaks. Decorate to your liking and dust with extra spice. I was craving cheesecake and ferroer roche chocolate, so you guessed it, I made a Ferroer Roche cheesecake! I scowered the internet in pursuit of finding my envisioned recipe but most of them weren’t all chocolate, they were a vanilla cheesecake with ferrero bits inside, noooooo my dream ferroer cheesecake wasn’t pictured like that. I thought, why don’t use my recipe for my black forest cheesecake (which I have made a few times and is a success) and omit the topping and add some crushed ferroers in the mix, what a brilliant idea, if I do say so myself! As this was an experiment I didn’t mind if it didn’t work out, but luckily it did work out. The only thing I would change is increase the amount of crushed Ferreros or I could add some hazelnuts in, instead. I felt it lacked that extra bite and texture I was after. This is good for those who are lovers of chocolate, it’s quite rich for some but I could eat it in one sitting. Well, at least my family and one of my friends really enjoyed it and that’s the main thing! I would make it again but next time I will adjust the recipe slightly to make it that extra bit special. 1. Preheat oven to 175°C. Butter a 9-inch round springform pan or a mini Victoria sponge tin set aside. 2. Place the chocolate in a ban marie to melt and stir occasionally once melted, leave to cool. 3. Whilst that is melting, make the base. Either process the cookies and sugar in a food processor until ground into fine crumbs or bash in a bag. Then add the melted butter. Press the crumb mixture evenly into the bottom of the prepared pan. Bake until the crust is set, about 8 minutes. Set on a cooling rack while the filling is prepared. 4. Place the cream cheese, sugar and cocoa powder in a stand mixer bowl beat together until light and fluffy, about 3 minutes, scraping down the sides of the bowl as needed. Add the eggs one at a time, beating well after each addition and scraping down the sides of the bowl before adding another. Add the cooled, melted chocolate and crushed ferrero roches beat until just combined. Using a rubber spatula to give it a final mix (the batter will be on the thick side) and pour the filling over the crust, smoothing the top into an even layer. 5. Bake until the center just barely wiggles when moved and the top looks dry, about 15-20 minutes. Cool for 5 minutes, then run a thin knife between the cake and the sides of the pan to loosen. 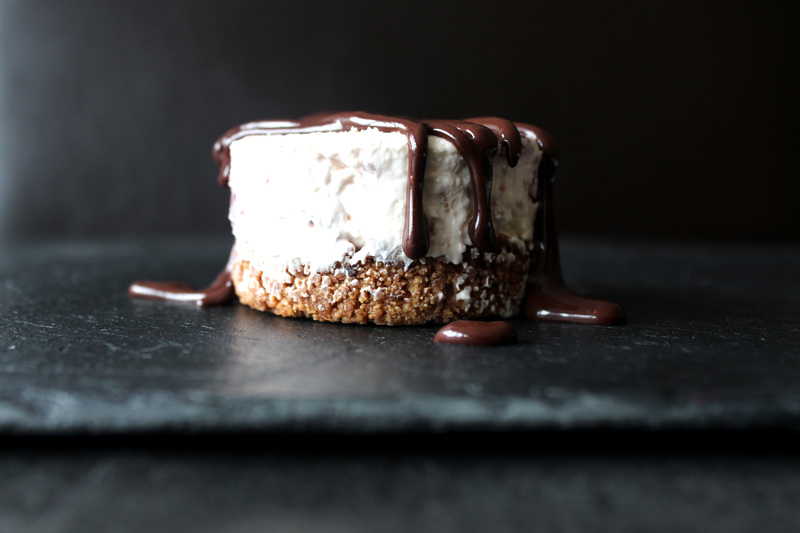 Transfer the cheesecake to the refrigerator and chill, uncovered, overnight. Place a thick layer of Nutella on top of the cheesecake and add some chopped hazelnuts and the top off with a Ferrero Roche. We had quite a few punnets of strawberries left over and had guest coming round. I wasn’t sure what to make but thought of making mini baked vanilla cheesecake with a strawberry sauce topping. 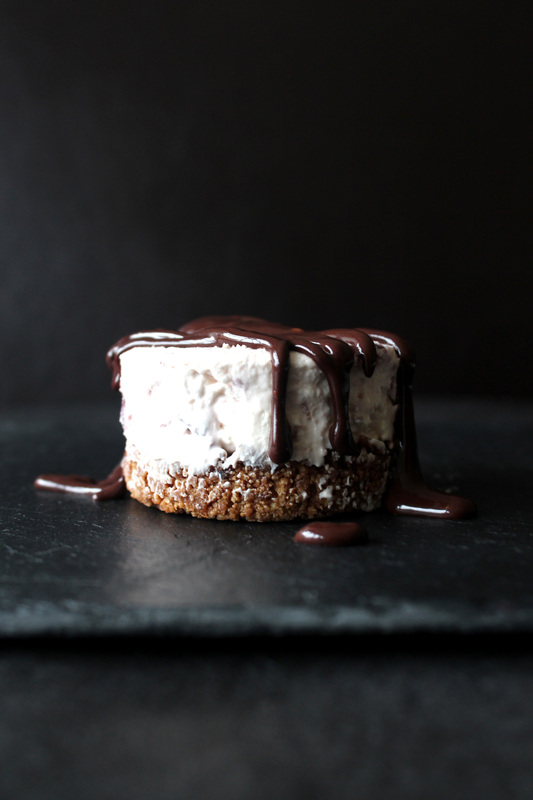 I have made a few cheesecakes in my time, I do find them to be a very indulgent and very satisfying dessert, most people I know do like cheesecake but I know it’s not to everyones taste. I used my recipe for the pistachio cheesecake I made to make this cheesecake, I really liked that recipe and my cheesecake worked well so I just tweaked it to fit this vanilla cheesecake. The cheesecakes turned out really well and the guests really liked it too, which I was pleased about. There was even enough for them to take home. An amazing mini baked vanilla cheesecake with a luxurious strawberry topping. 1. Grease and line a 12 cup base tray. 2. In a microwavable bowl add the butter and cook for 1min or until butter is totally melted. Meanwhile break the biscuits down and in a food processor process until fine. Place in bowl with butter add the sugar and mix until combined. 3. Place over 11/2 tablespoons of the base mixture into the 12 cup pan. Then place in the fridge to cool whilst making the cheesecake mix. 4. Preheat the oven to 160°C. In a stand mixer or hand mixer add the cream cheese and sour cream and beat, add the sugar, vanilla extract and beat until combined. On low speed add the eggs, one at a time, scraping sides after each additions. Do not overmix. Transfer batter to the prepared pan and tins . 5. Bake for 20-25 minutes. Turn oven off and leave the oven door slightly ajar, let cheesecakes cool in the oven for 2 to 3 hours then place in the fridge to cool completely before serving. 1. Place all the ingredients in a saucepan and bring to the boil and then let it cook for about 20-30mins. 2. Leave to cool before placing on top of cheesecakes. *Please use really good vanilla extract here it will make such a difference. I am a real fan of nuts and pistachios are one on my favs but as they are quite pricey they are mainly a treat when baking. These didn’t use as much nuts as I expected only 80g and little extra for the brittle. I love the taste of pistachios, they give off such an exotic vibe, their vibrant green colour it’s so beautiful and they have such a lovely distinctive flavour. These cheesecakes didn’t look that vibrant but the pistachio brittle did finish it off. The flavour was quite subtle, next time I think I would add a lot more pistachios in. The original recipe did call for lime zest and juice I didn’t use this as there was sour cream in the mix and I thought this would give the cheesecake a sour taste, I have usually used double cream in cheesecakes and not sour cream so wasn’t sure how this would turn out. I thought by adding the lime would encourage that sour taste and I didn’t want the cheesecake to be overpowered by the taste of lime. In the end the cheesecakes didn’t taste sour I couldn’t taste the sour in the cheesecake. Next time I think I would add the lime to give it that extra lift. The cheesecakes texture came out better then I expected as I found the mixture a little runny compared to other baked cheesecakes I’ve made. They are a very elegant and sophisticated desert and a real treat I will be making them again. 2. In a microwavable bowl add the butter and cook for 1min until butter in totally melted. Meanwhile break the biscuits down and in a food processor process until fine. Place in bowl with butter add the sugar and mix until combined. 4. Preheat the oven to 160°C. In a stand mixer or hand mixer add the cream cheese and sour cream and beat, add the sugar and beat until combined then add the ground pistachio and mix well. On low speed add the eggs, one at a time, scraping sides after each additions. Do not overmix. Transfer batter to the prepared pan and tins . 5. Bake for 25 minutes. Turn oven off and leave the oven door slightly ajar, let cheesecakes cool in the oven for 2 to 3 hours then place in the fridge to cool completely before serving. 1. In a heavy based pan (not non-stick). Add the sugar and water in heavy small saucepan over until it comes to a deep amber colour, occasionally brushing down sides of pan with wet pastry brush and swirling pan. Stir nuts (I chopped mine) into caramel and immediately pour onto prepared sheet. Working quickly and carefully (caramel is very hot and hardens fast), press tip of small knife into edges of caramel and gently stretch in all directions to form very thin sheet, approximately 12 by 10 inches. Cool brittle completely, then break into pieces. Break brittle into irregular pieces. Cheesecake is a family fav dessert of ours. I do think it’s a very good dessert something which you can’t really go wrong with and generally most people like it (generally!!). The non-baked one are generally really easy to make and quick. I usually don’t make baked cheesecakes as much. I brought a jar of cherries and didn’t know what to do with them so I thought why not make a cherry cheesecake. I have taken a very old recipe of cheesecake that I have used over and over again, it’s an actual lemon one and I had given that same recipe to a number of my relatives as they loved it too! I used this recipe as a base for this cherry cheesecake but I adapted it and made it more cherrylike. It however didn’t turn out how I expected as the cherries itself were not that great, they were not juicy as I thought or as flavoursome as I wanted. I ended up adding some cherrie compote into the mix to give it that extra kick but that did make the cheesecake a tad sweet. The cheesecake overall needed more cherry flavour and I think due to the cherries from the jar not being very flavourful was the main reason the flavour didn’t come out. I need to work on this cheesecake and make it taste as good as the lemon one! I do think that next I will buy a really good jar of cherries and it will sort out the problem so give it a try but make sure the cherries you buy are of good quality. 1. Place all the biscuits in a thick sandwich bag and bash with a rolling pin until it resembles crumbs. 2. Melt the butter in a saucepan and mix in the crushed biscuits and brown sugar. 3. Press the mixture into either a 8" loose base tin or mini tin with lose bases, press the mixture down and then place in the fridge to chill in the fridge while you make the topping. 4. Beat together the cream cheese, castor sugar, cherries and cherry compote until smooth and creamy. 5. Whip the double cream until you have soft peaks. 6. Mix together the cream cheese mixture and the cream. 7. Divide the mixture between the base or bases and chill for a couple of hours or overnight. It's important to allow time for refrigerating I usually make this overnight but 4 hours should be enough. I reduced the amount of sugar in this recipe so that it wasn't as sweet, but taste and add more if needed. 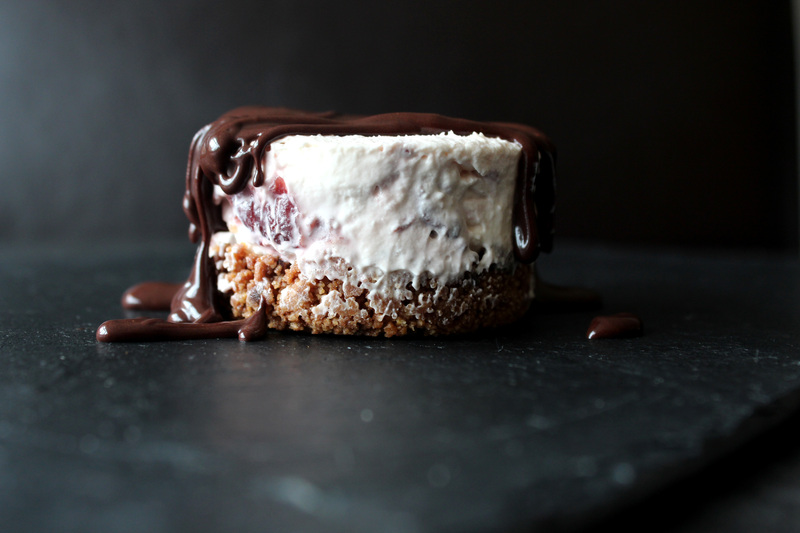 I added chocolate sauce over the cheesecakes as I think chocolate and cherry works well together.